Certainly caused a riot on the already raucous Scooter forums. And so it happened. Without warning. 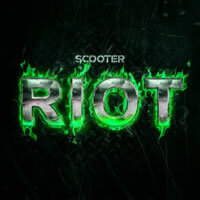 A new Scooter single was announced and released at the exact same time as an iTunes exclusive. They must have remembered that Beyoncé did that in 2013 with significant success. It's funny because I had been wondering earlier that very day if anything new was going to come out from the Scooter camp in the next little while. The answer was yes, and the answer was "Riot". From the three folks in Hamburg (and possibly others, since they now use songwriting camps to develop new tracks, as opposed to just flipping through the local used CD shop for ideas) comes a brand new tune, and this one's different than anything they've done in years. In fact, it harkens back to their career in the late 90s, long before current members Michael Simon and Phil Speiser ever joined the group. There's only one track on this release, which I'll refer to as the Radio Edit. A slightly awkward brief introduction leads the way where a young woman emotionally proclaims, "I can't be more than I'm already am. I'm terrified. Come with me. I love you." Ehhh... okay. But it doesn't take long for some pounding rhythms to break that tension as frontman H.P. Baxxter spits out more of his classic uplifting but partially nonsensical lyrics. His rhythm and tempo is actually faster in Riot than it's been in a long time (perhaps because Scooter's music has slowed down somewhat, especially during their last album), and that's a good thing — it shows he still has some of that powerful M.C. energy left! If you think a clash of rock and electronic music sounds like a match made in heaven, it might be advantageous to give Riot a try. And if you're an ex-Scooter fan that thought all the magic was lost, Riot will force you to perform a spit take and rethink whether or not the old Scooter is forever gone.